Abundant Design on "Green City"
Hear Lynnae Hentzen and I discuss environmental approaches to gardening and landscaping on the "Green City" show. 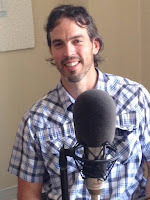 Tune in from 9:00 to 9:30 Friday morning on KFMG 99.1 Des Moines. Let's see what tasks our volunteer plants might be undertaking and how we can benefit from them in your landscapes. 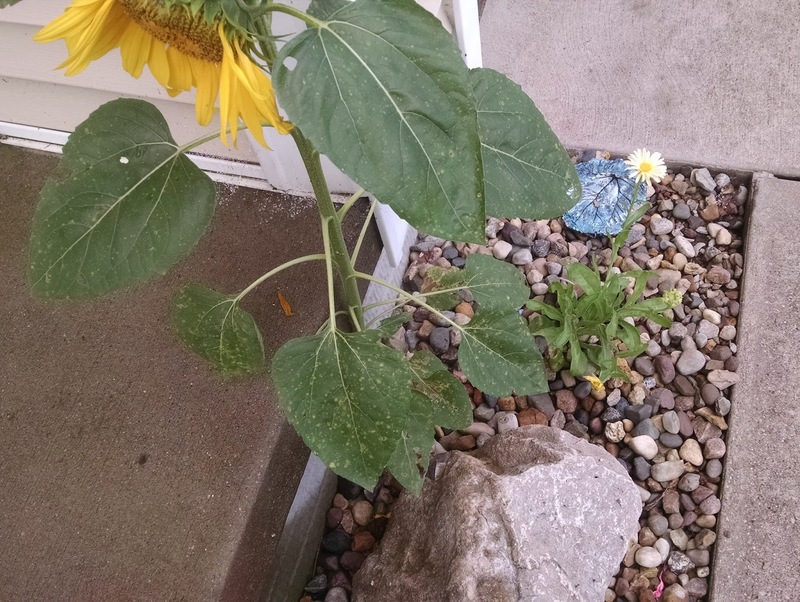 If you feed birds for enjoyment, you most likely will have Sunflower seeds in your mix. On your own or from your little feathered friends' table manners, you will have some spills, and sunflower seeds readily sprout. Our bird feeders have an ample supply of sunflower sprouts throughout the growing season. They could be considered a weed, as I didn't plant them, but the rabbits really love them! If they are eating delicious young sunflower sprouts maybe they will be less interested in the plants I really don't want them eating. Sunflower sprouts are often grown by urban farmers who market them (and other) micro-greens to local chefs and restaurants. 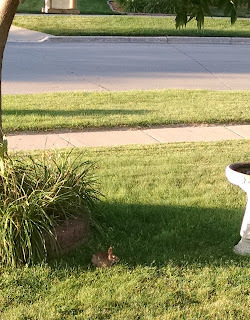 We've (and the rabbits too?) 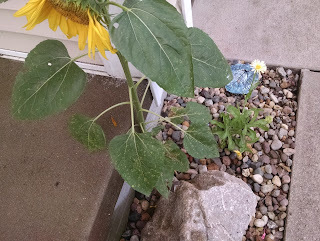 also let sunflowers grow if they aren't in really awkward places. They are fun to watch grow and bloom. Many pollinators like the flowers and birds love the seeds. After they mature you get more sunflower seeds, if you can beat the birds and squirrels to them. I'll harvest these heads, and save them in the garage to put out for the birds during the winter. 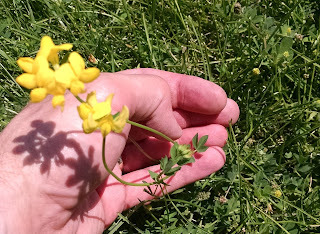 Birdsfoot Trefoil is another plant that "stepped forward" to come live at our house. 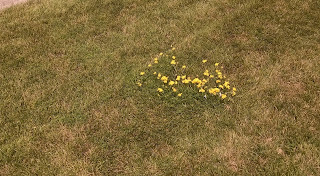 The yellow flowers, although small, are bright and abundant. 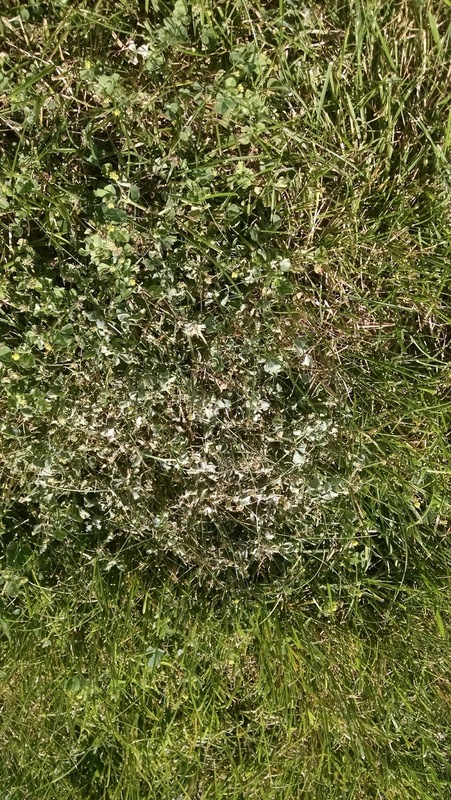 It is related to clover or alfalfa and is sometimes used for grazing forage on poorly drained, low pH soils. Birdsfoot Trefoil is a nitrogen fixer, meaning it can cooperate with certain bacteria in its roots, to convert nitrogen in the air into a form available to plants. This Milkweed recently "volunteered" in the irises out front. Although I might relocate it this fall, milkweed varieties provide the only food source for Monarch butterfly larvae. 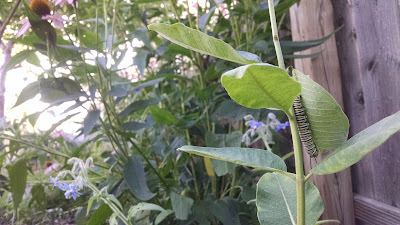 I haven't found any eggs or evidence of feeding on this plant, but there are a few Monarchs fluttering around. The milkweed in the backyard had a big one on it this week! Here's a Cosmos that "raised its hand" to bring blooms above the strawberry ground cover. This garden variety cosmos (probably Sensation) is often found in Butterfly Gardens and seed mixes. It is a favorite of birds, butterflies and bees. They can reseed themselves for several years and is probably what happened here as it is near where a butterfly mix was planted several years ago..
Have a great weekend, and enjoy the natural world around you! We hear about it all the time. Chemicals in our water - fertilizers, pesticides, pharmaceuticals and more. No, these are not good things! 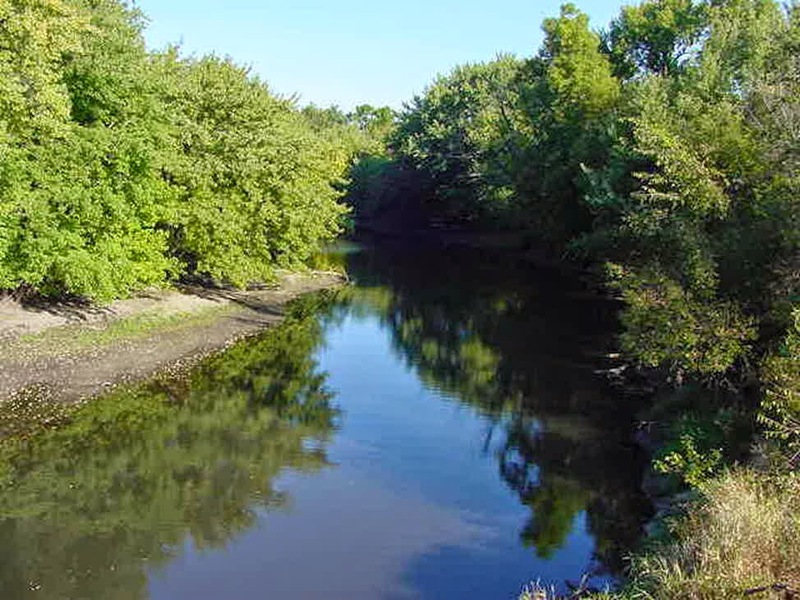 The Des Moines Waterworks has even made national headlines recently about suing several counties upstream for high nitrate levels in the Raccoon River. Nitrates can come from runoff from nitrogen rich soils, especially when fertilizers have been applied. 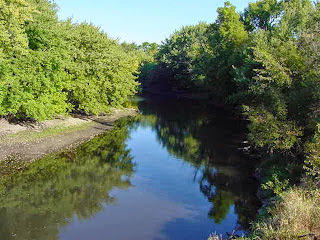 The Raccoon River is the source of most of Des Moines areas drinking water. These nitrates, linked to "blue baby syndrome" and some cancers, must be removed from drinking water by the waterworks facility to levels regulated by the federal government. Surprisingly many facilities put these nitrates back into the river downstream! Pesticides are also linked to many health problems. The battle rages on over glyphosate, commonly marketed as Round Up by Monsanto, whether or not it is a probable carcinogen and endocrine disruptor. No doubt the amount applied to herbicide tolerant crops has gone up! With these horror stories about the consequences of conventional farming, how much worse could it be? Surprisingly, much worse... about 10 times worse! Homeowners own more than half of the land in the United States, over half of our landscape is lawn! And, according to the United States Fish and Wildlife Service, they use up to 10 times more chemical per acre than conventional farmers! That's where we can make things happen! Our lawn care practices, along with everyone else's, can have a huge impact on our water and overall environmental quality. 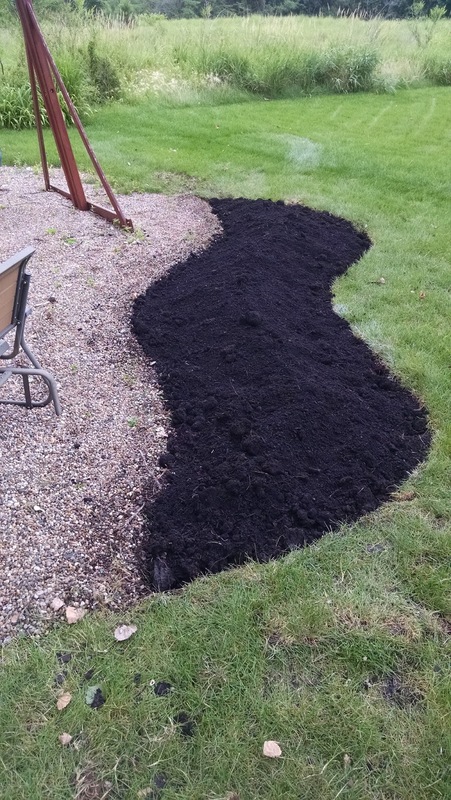 Building top soil, which is a major problem in newer developments, will help with overall plant health, whether its your lawn, flower beds or vegetable garden. Increasing organic matter will boost soil life making nutrients readily available to plants, and also help retain water during dry periods and allow the soil to be worked earlier during wet Springs. Mowing higher 3" or more will shade the soil keeping it from drying out and shade weed seedlings. 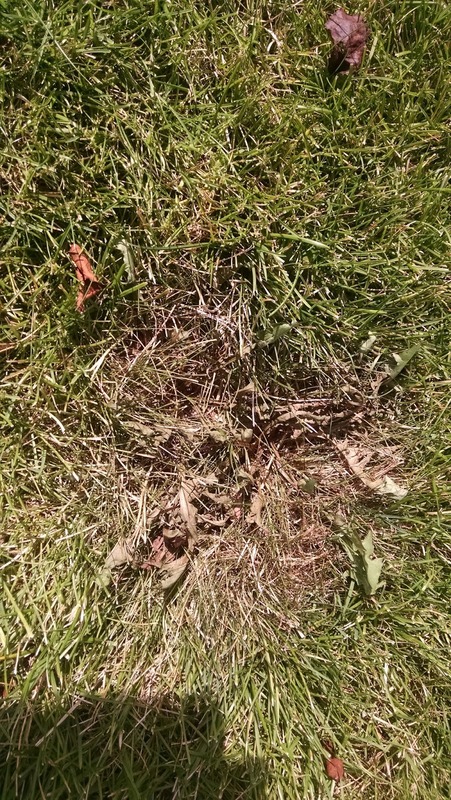 It will also promote deeper roots and thicker more competitive grass. Allowing a few "weeds", like clover to boost nitrogen or dandelion with its taproot that brings up nutrients from deeper in the soil than grass roots can access. 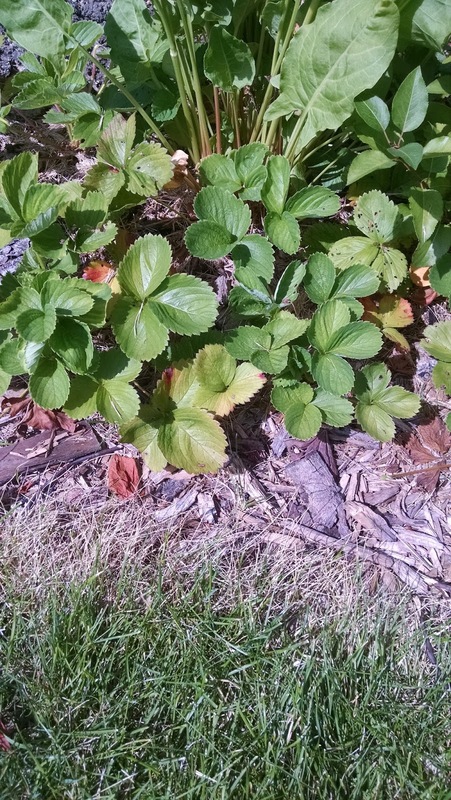 Use less toxic ways to control insects and weeds. Speaking of weed control, here's the secret recipe for an organic herbicide that's so "toxic" you can use it to make pickles! That's it! Pretty tough right? 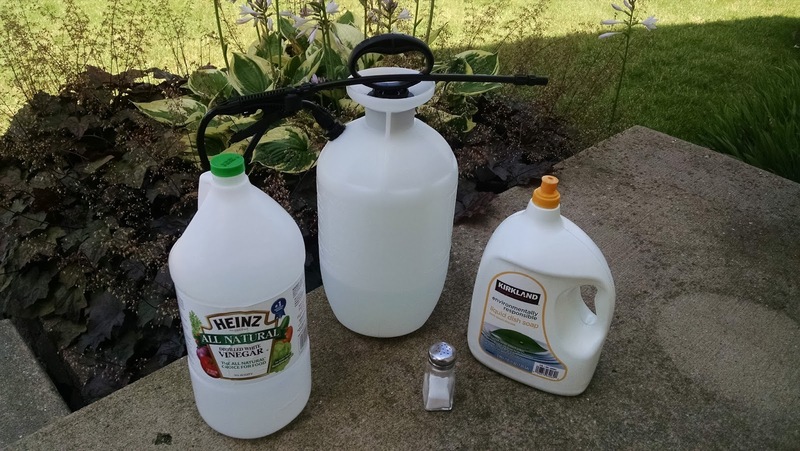 Vinegar alone is an excellent weed killer due to it's acetic acid content. Most varieties contain 5% acidity, but pickling vinegars can be up to 18%. 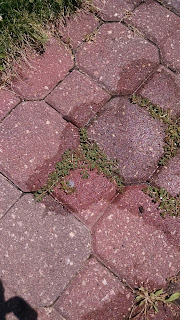 I've used plain old 5% vinegar to kill many weeds. But my new favorite is a combination of vinegar, salt and a surfactant like dish soap or an essential oil which will help the solution stick to the leaves giving it a better chance of working. I know this stuff works. Applying earlier in the day, when the sun is really going to shine, helps it achieve better results. This also works best with younger weeds, older established plants may need several applications to finally kill the root. Here are some pictures. A bit of caution before you spray your yard with this. It is non-selective, like glyphosate. 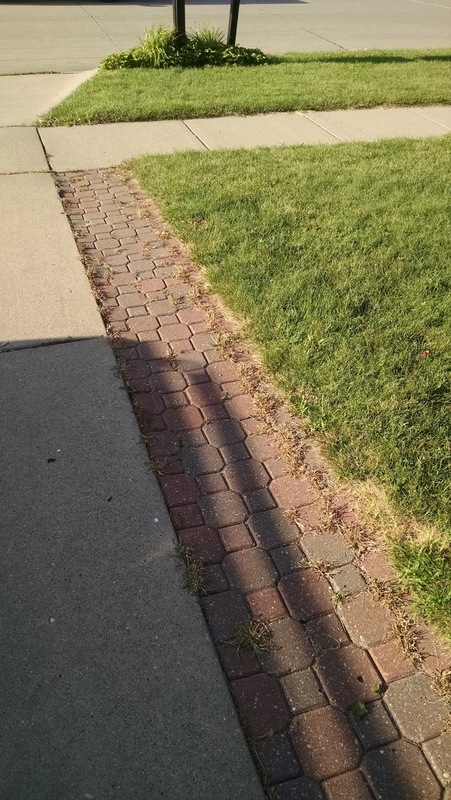 That means it will kill most everything, including your grass. 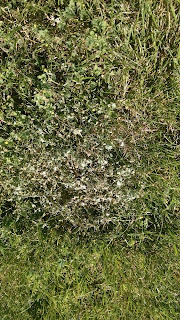 So start with smaller amounts when attacking weeds in your lawn, see the light spray on the above picture of black medic. 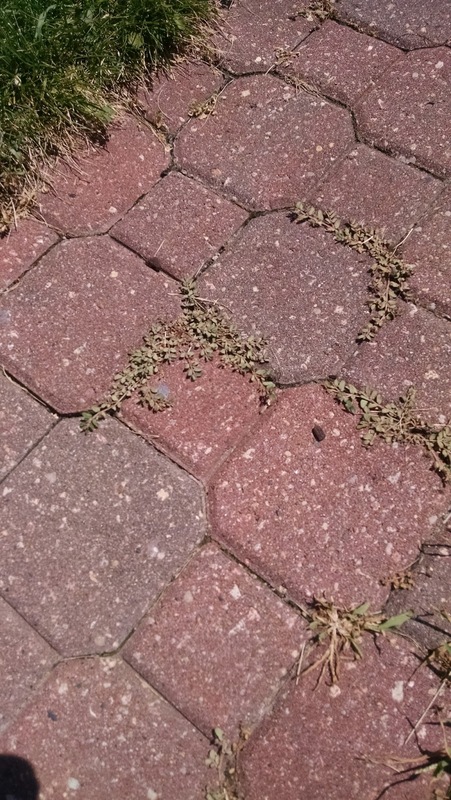 This makes it great for reinforcing an edge of a planting bed, or killing weeds that are invading cracks in your sidewalks or patios. 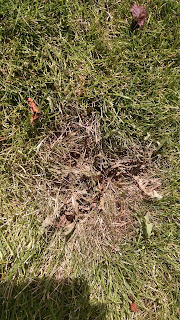 Another caution with this herbicide is that it can leave a bare patch, which is usually filled back in quickly with grass by rhizomes, but can occasionally be an invasion site for opportunistic weeds such as crabgrass. Also,vinegar is often used as a "green" cleaner and disinfectant, which means it kills bacteria and fungi, including beneficial bacteria and fungi that live in the soil. So, keep your applications small and on target, using only as much as necessary, for best results. 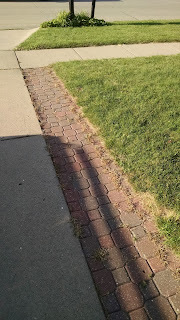 Have a great week, and I encourage you to take The Great Healthy Yard Project pledge by visiting TGHYP.org. Summer Sustainability Series event this Thursday! 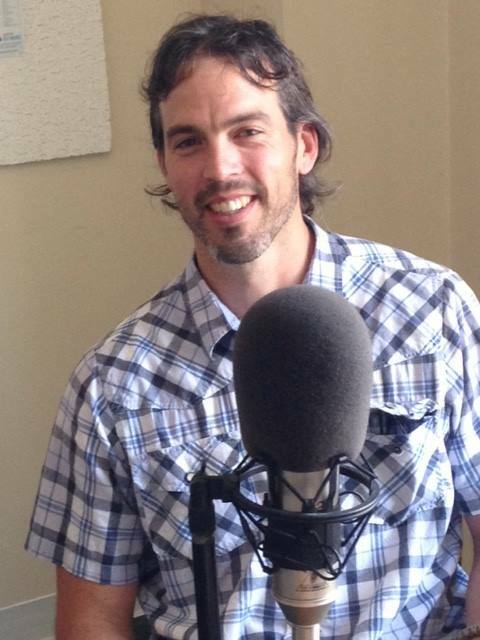 Join me this Thursday for an introduction to Permaculture, the Ethics and Principles. Learn how to go beyond organic and change your whole concept of sustainability! There will also be a youth cooking class for children, facilitated by Food Corps of Iowa! 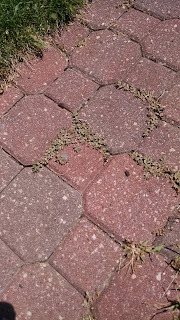 Lambsquarter - Underappreciated Plants & "Weeds"
According to Merriam-Webster.com the definition of a weed is: a plant that is not valued where it is growing and is usually of vigorous growth; especially : one that tends to overgrow or choke out more desirable plants. This is a term often applied to Lambsquarters, the next "weed" in our series of Underappreciated Plants. 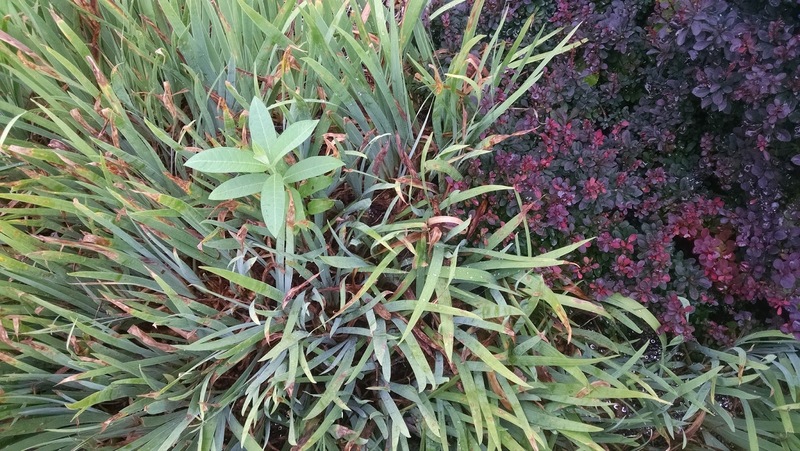 If not cultivated carefully it can become invasive and outcompete many plants for nutrients. It is probably a native of Europe, although its early use as a food crop makes it hard to pinpoint. 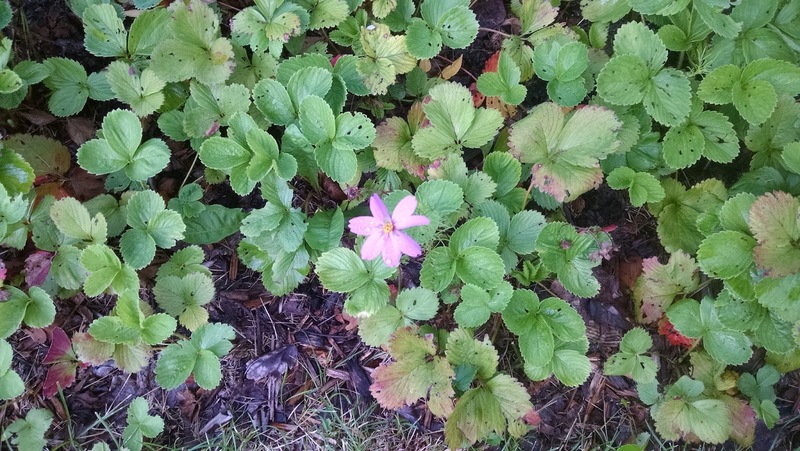 It came to North America with the Europeans, and is quite common in gardens and fields. 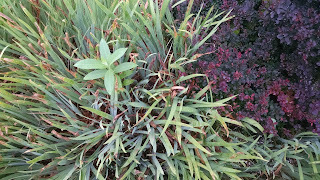 It's very hardy, grows vigorously and is a prolific seeder. Therefore is a main target of many herbicide applications. It is a nutrient powerhouse loaded with vitamins and minerals, as well as a fair amount of protein. Don't forget I'll be leading the Forest Avenue Outreach "Summer Sustainability Series - Permaculture & Your Garden" talk this coming Thursday! We celebrated the birthday of the USA and another this weekend. 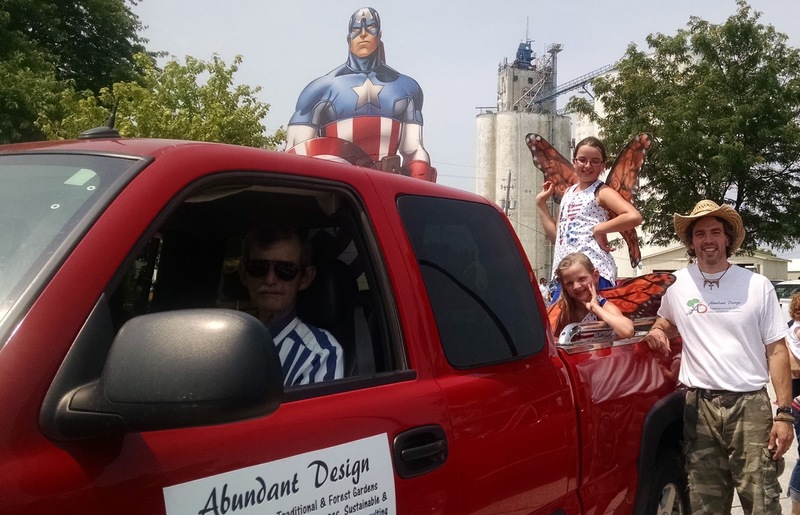 While our families were here for the long weekend I recruited some help for Waukee's Fourth of July parade - my mom & dad, a couple "Monarchs" and Captain America! During their visit we got found a few good leaves yet of some romaine lettuce and an onion for our burgers. We even talked some of the grandparents into trying a few Borage flowers and watched the honeybees work. Earlier in the week I prepped a backyard pollinator bed that will be planted by the homeowner when she gets her suggested plants. 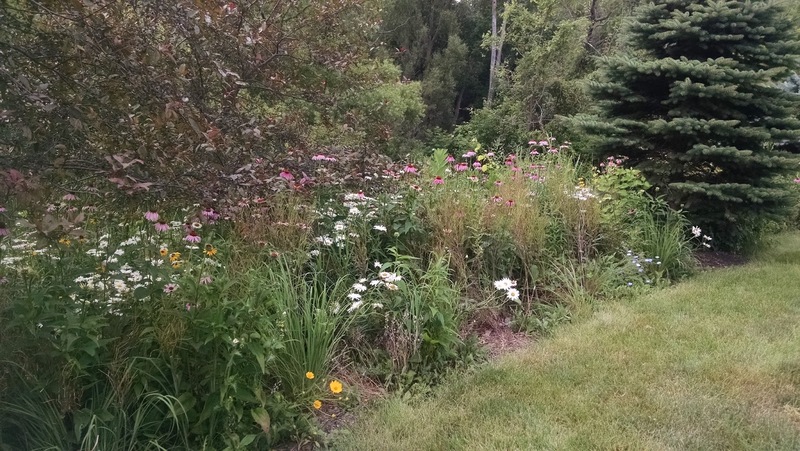 They will get to enjoy the colorful flowers and butterflies while playing on the swing set. I got done just in time to meet up with everyone for supper! Finally, we finished up the weekend with a trip to one of our great local parks. 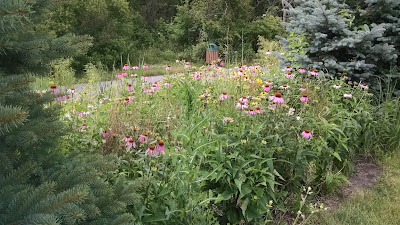 Wildwood Park in Clive has a very nice patch of prairie wildflowers along the Greenbelt Trail. 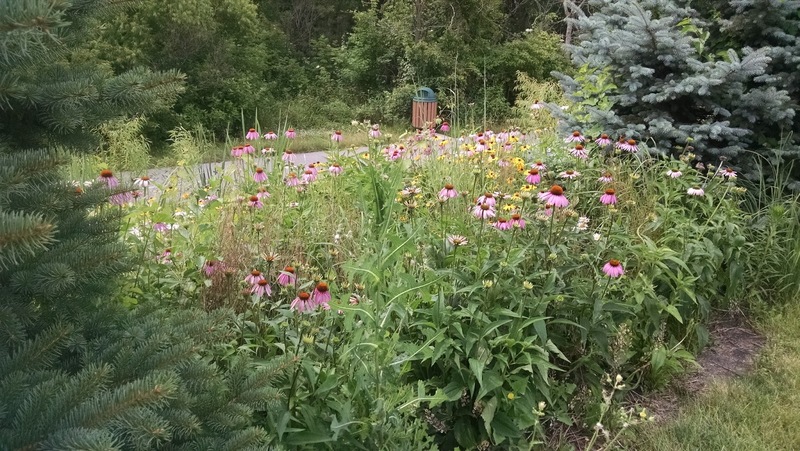 Coneflowers, daisies, milkweed and more are included for a nice feeding area for pollinators for all kinds. 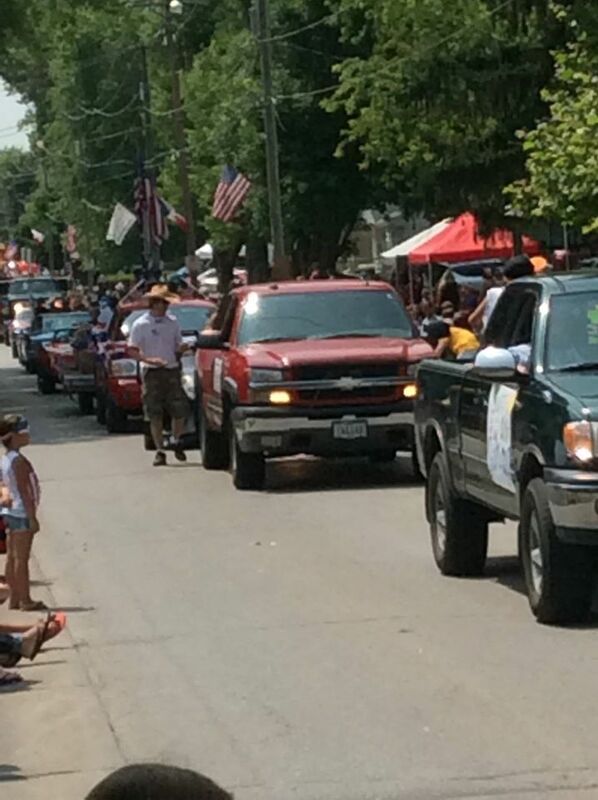 I hope you had a festive and patriotic weekend, too!